Let’s look at each one of these separately. The closer your subject is to the camera lens, the less depth of field you will have. With close-up or macro photography, you’ll have a very shallow depth of field, so what you focus on becomes very important. 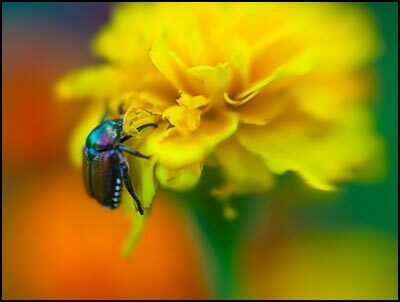 As you increase the distance from your subject, you also increase the depth of field. If you are shooting a distant subject and nothing important to your picture is very close to the camera, then depth of field will usually render the entire scene as acceptably sharp. Choosing a larger f-stop is known as “opening up the lens” and choosing a smaller f-stop is known as “stopping down the lens”. So for less depth of field you open up and for more depth of field you stop down. Lens focal length is a third factor that is sometimes said to affect DOF. Shorter focal length lenses yield a greater DOF than longer focal lengths. This can be shown to be a false idea, but let’s be practical about it and see why this is a commonly held belief. As a result, the area of acceptable sharpness … or depth of field … will appear greater. Those who argue to prove that the DOF is really not greater will show you that if you enlarge and crop the image until it matches the longer lens’ view, the DOF will be the same. While technically correct, why would you take a shot with a short lens only to enlarge it to an image you could get by using a longer focal length lens? You might have to on occasion when changing lenses or zooming in on your subject is not possible, but for the most part you’d choose the focal length that renders an image close to the final view you want. So if you use a shorter focal length and don’t enlarge it excessively, the area of acceptable sharpness will appear greater … thus seemingly you have a greater DOF. Of course, the same is true for a telephoto shot … it will seem to have less DOF. Since depth of field is relative to a single plane of focus, it is important to know exactly where to focus your lens to get the maximum DOF in your images. 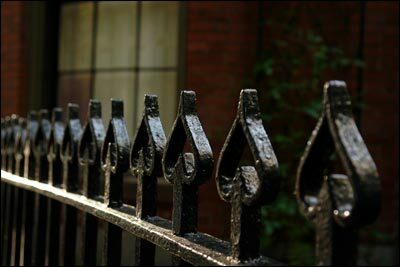 At normal shooting distances, DOF is divided roughly into thirds…1/3 in front and 2/3 behind your focus point, as illustrated in this photo of an iron fence. In the above example, the photographer has focused on the 3rd rail from the right. On the larger image you should be able to notice that the 2nd rail is less in focus than the 4th rail. Why is this important for you to know? Sometimes you may have both near and far objects in your composition that you want to appear sharp. So by focusing at a point about 1/3 of the distance between these two objects you will get the maximum depth of field. While understanding depth of field may seem daunting at first, it is well worth whatever time you spend in learning to apply it in your photography. A working knowledge of depth of field will give you a very powerful and creative tool that can make your photos far more interesting and effective. Your comments on this article will be appreciated and your feedback will help me improve the content. clears the concepts regrding phography !! i just learnt, dof, depth of field, focus..
Nice easy to follow explanations. This is good info to know and well written. I can already see how I am going to incorporate this into my photography.